I should begin, of course, with the standard disclaimer: the views I express here are my own and do not reflect the views of the Securities and Exchange Commission, my fellow Commissioners, or the SEC’s terrific Staff. And, because I’m in the unique position of testifying before a sister agency, a further caveat is necessary: I work at the SEC, not the FTC, and the two agencies’ missions and perspectives on our markets are not the same. But as I explained in recent remarks, I fear that we at the SEC have forgotten a crucial part of our mission: competition. As a matter of law, policy, and history, ensuring competition in our capital markets is a critical part of the SEC’s work. Indeed, before my agency even existed, the 1933 Securities Act was interpreted and enforced by the Securities Division of the FTC, so in a very real sense the FTC is the birthplace of the SEC. So it’s good to be home. Today’s hearing shows why it’s a mistake to leave addressing the lack of competition in our capital markets solely to the SEC’s sister agencies. Instead, as I have called for, the FTC and SEC should be working closely together so we can better oversee our markets. The subject of today’s hearing—competition and consumer protection in the twenty-first century—highlights the compelling need for close collaboration between our agencies. And I hope my appearance before the FTC today marks the beginning of that partnership. Today’s hearing focuses on a pressing question in modern markets: whether institutional investors, and especially passive index funds—the preferred savings vehicle for millions of retail investors—can decrease competition, resulting in higher prices for American consumers. This is a critical debate that demands and deserves the attention the FTC is giving it with these hearings, and I’ll share my views on that subject shortly. But I’ve come here today to urge this Commission, and mine, to view common ownership for what it is: an investor protection problem. Each year, institutional investors cast votes in corporate elections on behalf of more than 100 million American families, wielding significant power in the future of our companies and communities. Yet investors do not get nearly enough information about how their money is being voted. It’s time for that to change. Today’s hearing is a victory for those who believe that researchers have a responsibility to pursue policy impact in their work. The reason, of course, is that the debate we’re having is occasioned by an important and fascinating paper by the exceptional scholars Jose Azar, Martin Schmalz, and Isabel Tecu in the Journal of Finance. The study provides evidence of correlation between measures of common ownership and lower output. And in important work building on those findings, Einer Elhauge argues that antitrust law permits enforcement actions on the basis of evidence of this kind. Although a detailed assessment of the methodological issues raised by this work is beyond the scope of these brief remarks, as a researcher my reaction is that we’re at the beginning, rather than the end, of the academic debate about concentrated common ownership. Like most landmark papers, the work by Professors Azar, Smaltz, Tecu, and Elhauge, for now, provide policymakers with more questions than answers. There are at least two reasons why. First, as important work by Scott Hemphill and Marcel Kahan argues, the current evidence does not sufficiently distinguish between two different potential strategies through which common owners could weaken competition. On the one hand, common owners might restrict output throughout an industry, aiming to increase the value of all firms at consumer expense. On the other, they might take actions that decrease the value of one firm in order to increase the value of their other holdings in that industry. From the perspective of a securities regulator, there is an enormous difference between the two, because less-diversified investors will oppose value-decreasing strategies but not value-increasing ones—and the current evidence we have bears only on the latter, not the former. Future research in this area should expressly examine that difference—using evidence of the behavior of less-diversified, but significant, institutional investors to buttress any case that common owners decrease firm value in pursuit of anticompetitive ends. Second, the literature does not yet identify a convincing causal mechanism through which concentrated common owners could achieve anticompetitive ends. As Professors Hemphill and Kahan explain, institutional investors could do this through actions at both the “macro” level (that is, at the level of firmwide policies) and the “micro” level (relating to specific actions of a firm). But, as their paper shows, many of those potential mechanisms are, thus far, untested by the literature. In this way, their paper serves as a critical research agenda for those concerned about the effects of concentrated ownership on competition. As Professors Hemphill and Kahan point out, one potentially compelling possibility is that concentrated common owners take an approach to executive compensation that leads top managers to reduce competition in particular industries. Some evidence provides support for such a mechanism; other work comes to the opposite conclusion. As a researcher whose work has emphasized the importance of corporate managers’ wealth-creation incentives, I am sympathetic to the notion that executive compensation might be a channel for communicating investor preferences. But I’m also aware that the organizational complexity of today’s largest public companies makes it far from clear how—even if top managers receive an anticompetitive signal from their pay packages—those incentives affect those making pricing decisions throughout the organization. For these reasons, I worry that the evidence we have today may not carry the heavy burden that, as a Commissioner sworn to protect investors, I would require to impose costly limitations on the diversified investments that American families count on to fund their education and retirement. As Ed Rock and Dan Rubenfeld have explained, alternative proposals might meet the same goals at lower cost to investors. And the unintended consequences of such a change could be far-reaching. Research on whether the common ownership of stocks by a few large funds poses an antitrust problem raises important questions about the future of competition policy. Whatever one thinks of that work, I worry that the academic debate thus far has distracted us from a pressing problem. Whether concentrated common ownership has led to weakened competition can and should be debated. What is not debatable, however, is that we are at a pivotal moment in financial history when corporate elections are increasingly decided by a handful of powerful index fund managers. That concentration of power is an urgent corporate governance challenge of our time. Unfortunately, the SEC’s current rules leave investors largely in the dark about how these institutions are voting the shares that underlie American families’ savings. That’s why I’m here today to call on my colleagues at the SEC to pursue rules that will take advantage of existing data on institutional voting to empower investors with better information as to how their shares are voted in the elections that will determine the future of American capitalism. How did we get here? We should begin by acknowledging the enormous success that index funds have enjoyed since their creation more than a generation ago. That success, of course, stems from the fact that index funds have given millions of American families a low-cost means of participating in the Nation’s economic future. It is no surprise that hardworking Americans leapt at the chance to be a part of our stock market’s growth, and have made index funds among the most popular innovations in the history of modern finance. That’s why, by 2013, index funds and similar exchange-traded funds made up more than 10% of U.S. public company ownership. Indeed, Coates has convincingly argued that this figure may underestimate the pervasiveness of passive ownership—and that more than 20% of global assets are now owned by passive vehicles. The rise of passive funds has had enormous benefits for individual investors—but comes with a cost for corporate accountability. As New Dealers Adolf Berle and Gardiner Means explained in their seminal text, public ownership of America’s largest companies separated ownership from control, giving corporate insiders the power to manage American industry in a way that favors managers’ private interests over those of public investors. In response, the Nation developed investor-protection laws requiring audits, disclosure, and SEC oversight. Those laws—and the Delaware fiduciary-duty protections that have evolved over generations—rely on investors to use the shareholder vote to discipline wayward corporate managers. In a way, the massive scale of index funds gives hope to those concerned about holding insiders to account. The reason is that, by consolidating the disparate shareholdings of millions of Americans, funds may be able to overcome the collective-action problems all individual voters face—and make corporate elections a real deterrent for managers who would otherwise take advantage of distracted shareholders. The problem is that index funds are not immune from the economic reality that they may pursue their own interests rather than those of their investors. As Delaware’s Chief Justice has explained, index funds and the large institutions who run them “separat[e] ownership from ownership.” The ordinary Americans who use index funds to save for their retirements don’t directly own, and therefore don’t directly vote, the shares of the largest U.S. public companies. As a result, a few large institutions today vote millions of American families’ money in corporate elections that will help decide our economic future. So the problem we face is that institutional investors might vote Americans’ money in a way that reflects the institution’s interests rather than those of investors. Some, like Lucian Bebchuk and Scott Hirst, worry that fund managers underinvest in oversight of the companies they own and can be too deferential to corporate management. Others have the opposite concern: that these powerful institutions lack necessary information to guide corporate decisionmaking. And still others have observed that large institutions often allow other investors, like hedge funds, to set the corporate agenda. Whatever one thinks about those debates, all should agree that American investors are entitled to understand how their money is being voted in corporate elections. That’s why it’s time for the SEC to bring transparency to the increasingly important voting practices of major institutional investors. Large institutions, and especially index investors, wield unprecedented power in corporate elections—power that comes from the savings of millions of American families. What can the SEC do to make sure that ordinary investors understand how institutions are wielding their influence? We should start by shining light on how institutions vote Americans’ money. For more than a decade, the Commission has required funds to provide detailed disclosure of institutional investors’ voting policies and records. The resulting data are rich and detailed. But the information is utterly incomprehensible to the ordinary investors whose money is at stake. Recognizing the need to give investors clear, concise information on how their money is voted, several leading institutional investors have taken important steps toward transparency, publishing policies that govern their voting decisions. But those policies can be difficult to enforce and thus modest in effect—and, besides, they don’t tell investors how their money was actually voted in corporate elections each year, information we have but don’t use. Figure 1. The Party Structure of Mutual Funds. Whether the Bubb-Catan approach, or a competing method, is the best way to show how institutional investors vote is beyond the scope of my testimony. Instead, my focus is on the fact that important information these funds already produce can be used to show American families how their money is being voted in corporate elections. That’s information that ordinary investors should have when they decide where they put their money. We at the SEC should be taking steps to make sure that American investors understand how their retirement savings are being used in corporate elections. That’s why I’m urging my colleagues at the SEC to pursue new rules requiring clearer, summary disclosure of the voting behavior of institutional investors relative to other voters’ views on corporate elections. Although transforming the overwhelming data funds already produce into meaningful accountability to American investors will be complex, as the scholars at today’s hearing have shown, it can be done. We at the Commission should draw on this work in moving forward with rules providing transparency in this area. The legitimacy of corporate elections and the institutional investors who have served American families so well demands nothing less. Today’s hearing marks an important step forward in the relationship between all of you at the FTC and our work at the Securities and Exchange Commission. The effects of common concentrated ownership on competition across the American economy deserve close, careful study, and I am grateful for the perspectives that all of today’s presenters will bring to those questions. I have no doubt that market participants across the Nation will pay close attention to today’s proceedings—and to the next steps for the scholarship in this area. I certainly will. In the meantime, I urge you to consider one of the pressing investor protection problems of our time: shining light on the voting of the institutional investors who increasingly dominate corporate elections. Many of the scholars in this room have helped us better understand how we can use new technology and existing data to give investors more transparency about how their money is voted. Thank you for that, and for the opportunity to testify before you today. I look forward to the work ahead—and learning more about how best to hold powerful institutional investors accountable for their increasingly important role in our Nation’s future. * Commissioner, United States Securities and Exchange Commission. I am deeply grateful to my colleagues Robert Cobbs, Caroline Crenshaw, Marc Francis, Satyam Khanna, Prashant Yerramalli, and Jon Zytnick, whose hard work made these remarks possible. We are also grateful to Professors Ryan Bubb, Emiliano Catan, Marcel Kahan, and Ed Rock of the New York University School of Law, Lucian Bebchuk, Einer Elhauge, and John Coates of the Harvard Law School, and Jeffrey Gordon of the Columbia Law School for important insights that have deepened my thinking on these questions. Any errors are solely my own. Notwithstanding the foregoing, my own personal caveat also applies: “I fully expect to convince my colleagues of the absolute and obvious correctness of my views.” Commissioner Robert J. Jackson, Jr., The Middle-Market IPO Tax (April 25, 2018) (remarks at the Greater Cleveland Middle Market Forum); see also D.J. Khaled, All I Do is Win, Victory (Feb. 8, 2010) (providing a framework in which one repeatedly wins, “no matter what”). See Commissioner Robert J. Jackson, Jr., Competition: The Forgotten Fourth Pillar of the SEC’s Mission (Oct. 11, 2018) (remarks at the Open Markets Institute and Village Capital). See id. (citing Letter of Felix Frankfurter, Professor, Harvard Law School, to Franklin D. Roosevelt, President of the United States (May 23, 1934)). I’m impressed that my FTC colleagues managed to schedule this hearing here in my hometown, New York. While you’re all here, I encourage the FTC Staff to use its time in New York to examine the consumer-protection issues raised by allowing Washington, D.C. restaurants to refer to food products combining cheese, sauce and bread as “pizza.” See, e.g., Dave Constantin, Slices in Washington D.C., Serious Eats (January 2011) (concluding that pizza sold in Washington, D.C. can, under some circumstances, “violate your right to a decent pie”). See Douglas H. Ginsburg, Why Common Ownership is Not an Antitrust Problem, Harv. L. Sch. F. on Corp. Gov. & Fin. Reg. (December 4, 2018) (citing Investment Company Institute, Investment Company Fact Book: A Review of Trends and Activities in the Investment Company Industry (58th ed. 2018)); see also Keith Klovers & Douglas H. Ginsburg, Common Ownership: Solutions in Search of a Problem, in 2 Liber Amicorum (Nicholas Charbit et al., ed., 2019). Jose Azar, Martin C. Schmalz, and Isabel Tecu, Anticompetitive Effects of Common Ownership, 73 J. Fin. 1513 (2018). Of course, that paper builds upon previous theoretical work describing the possible anticompetitive effects of concentrated common ownership. See Julio J. Rotemberg, Financial Transaction Costs and Industrial Performance (Massachusetts Institute of Technology Working Paper No. 1554-84) (1984); Daniel P. O’Brien & Steven C. Salop, Competitive Effects of Partial Ownership: Financial Interest and Corporate Control, 67 Antitrust L.J. 559, 583 (2000). In more recent work, Professors Azar, Raina and Schmalz reach similar conclusions regarding the consumer-banking industry. See Jose Azar, Sahil Raina & Martin Schmalz, Ultimate Ownership and Bank Competition (working paper) (July 24, 2016). See Einer Elhauge, Horizontal Shareholding, 129 Harv. L. Rev. 1267,1272 (2016) (“When the same set of institutional investors has large, leading stockholdings across such a concentrated product market, their horizontal shareholdings are likely to be problematic.”); Einer Elhauge, The Growing Problem of Horizontal Shareholding, 3 CPI Antitrust Chronicle 1 (2017); see also Fiona Scott Morton & Herbert Hovenkamp, Horizontal Shareholding and Antitrust Policy, 127 Yale L.J. 2026 (2018). For a detailed analysis of the contested robustness of the findings in Azar et al., supra note 6, compare Pauline Kennedy, Daniel P. O’Brien, Minjae Song and Keith Waehrer, The Competitive Effects of Common Ownership: Economic Foundations and Empirical Evidence (working paper, July 26, 2017) (“Contrary to recent research based on the same data, we find no evidence that common ownership raises airline prices.”) with Jose Azar, Martin C. Schmalz & Isabel Tecu, The Competitive Effects of Common Ownership: Economic Foundations and Empirical Evidence: Reply (working paper, Sept. 20, 2018) (contesting the conclusions of Kennedy, O’Brien, Song, and Waehrer that the original paper’s estimates should not be interpreted as effects of common ownership). Thus, as both a researcher and regulator I can agree with neither the blanket assertion that “common ownership is not an antitrust problem,” Ginsburg, supra note 5, nor that “there is no merit to various arguments for delaying any enforcement action” on the basis of what we know today. Einer Elhauge, New Evidence, Proofs, and Legal Theories on Horizontal Shareholding, at 3 (working paper, January 2018). Additional reasons to pause before proceeding with broad antitrust enforcement initiatives in this area are given in an excellent recent paper by Ed Rock and Dan Rubinfeld. See Edward B. Rock & Daniel L. Rubinfeld, Antitrust for Institutional Investors, 82 Antitrust L.J. 221, 238 (2018) (raising “fundamental questions about the core theoretical move of [this literature:] the extension of the . . . MHHI framework from cross-ownership to common ownership”); see also Menesh Patel, Common Ownership, Institutional Investors, and Antitrust, 83 Antitrust L.J. ___ (forthcoming 2019) (urging “case-by-case” evaluation of the evidence in this area). See C. Scott Hemphill and Marcel Kahan, The Strategies of Anticompetitive Common Ownership 15-17 (working paper Nov. 30, 2018) (pointing out that MHHI?, the measure employed in the bulk of this scholarship, is appropriate only for strategies “in which the conduct in question is preferred by [concentrated owners] but not [undiversified investors in the firm].”). Id. at 19 (“Thus, as to mechanisms wherein a CCO raises firm value, the [approach in Azar et al., supra note 6] not only does not test such mechanisms, but is inconsistent with their use.”). To be sure, MHHI can offer valuable insight on the relationships among ownership structure and investor activity, which is a crucial question implicated by several regulatory initiatives now before the SEC. For an example of important new research using these measures, see Alon Brav, Wei Jiang, & Tao Li, Picking Friends Before Picking (Proxy) Fights): How Mutual Fund Voting Shapes Proxy Contests (working paper) (2018) (evaluating the relationship between MHHI and institutional investors’ votes in proxy contests). Hemphill & Kahan, supra note 11, at 57 tbl. 5 (describing five potential mechanisms through which concentrated ownership might pursue decreased competition, and concluding that three have so far been untested by the literature). One potential mechanism that has been tested, to a limited degree, is a strategy of selective omission—that is, for concentrated institutional owners to engage less fully with companies in order to achieve anticompetitive ends. See id. at 55 (“Selective omission should generate no resistance by the targeted firm nor raise any eyebrows.”). Importantly, however, the current literature does not distinguish among the different opportunities and incentives faced by institutions managing largely passive funds versus those with significant assets in active strategies—an important institutional distinction that future work can and should explore. Compare Miguel Anton, Florian Ederer, Mireia Gine & Martin Schmalz, Common Ownership, Competition, and Top Management Incentives (ECGI Finance Working Paper No. 511/2017) (identifying industry-level relationships between MHHI and executive pay on the basis of industry-relative analysis) and Lantian Liang, Common Ownership and Executive Compensation (working paper) (2016) (coming to a similar conclusion) with Heung Jin Kwon, Executive Compensation Under Common Ownership (working paper) (2016) (using executive pay “flows” as the principal measure and arriving at the opposite conclusion). See Robert J. Jackson, Jr., Private Equity and Executive Compensation, 60 U.C.L.A. L. Rev. 638 (2013) (using, like Anton, Ederer, Gine & Schmalz, supra note 15, standard pay-performance measures borrowed from Brian J. Hall & Jeffrey B. Liebman, Are CEOs Really Paid Like Bureaucrats?, 113 Q.J. Econ. 653, 671 (1998) and Xavier Gabaix & Augustin Landier, A Multiplicative Model of Optimal CEO Incentives in Market Equilibrium, 22 Rev. Fin. Stud. 4881 (2009), to examine the sensitivity of top executives’ wealth to their firms’ performance). See Robert J. Jackson, Jr., Stock Unloading and Banker Incentives, 112 Colum. L. Rev. 951 (2012) (studying the organizational relationship among stock-based incentives for executive officers and senior managers at large financial institutions); see also Viral Acharya, Lubomir P. Litov & Simone M. Sepe, Non-Executive Incentives and Bank Risk-Taking (working paper) (2014) (offering evidence of some dissonance among executive and non-executive incentives at financial institutions). See, e.g., Eric A. Posner, Fiona M. Scott Morton & E. Glen Weyl, A Proposal to Limit the Anti-Competitive Power of Institutional Investors, 83 Antitrust L.J. ___ (forthcoming 2019) (arguing that the Department of Justice and Federal Trade Commission should adopt a “safe harbor” from federal antitrust enforcement for institutional investors who limit their holdings in an industry to less than 1% of the total size of the industry); Rock & Rubinfeld, supra note 10, at 37 (“from the [ordinary, diversified] investor’s perspective, the most dramatic change would be that costs would go up”). Although I am unpersuaded that the evidence we have today supports their particular policy proposal in this area, these scholars have offered a series of insightful new ideas that are receiving much-deserved attention. See Eric Posner & E. Glen Weyl, Radical Markets: Uprooting Capitalism and Democracy for a Just Society (2018). See Edward B. Rock & Daniel L. Rubinfeld, Defusing the Antitrust Threat to Institutional Investor Involvement in Corporate Governance (working paper 2017) (proposing an alternative safe harbor). John C. Coates, The Future of Corporate Governance Part I: The Problem of Twelve, at 1 (working paper) (Sept. 2018). Coates explains: “Twelve is an imprecise metaphor for a “small number”—for a given public company, the number might be even smaller, or modestly larger—but is the typical size of a public company board. In effect, indexation is concentrating power over all public companies in the hands of one board-sized group.” Id. & n.1. He concludes that policymakers’ goals should be “to preserve the agency-cost reducing impact that concentration of ownership in fewer hands has on portfolio companies, while addressing the potential agency costs, and legitimacy and accountability challenges that related concentration creates.” Id. at 23. I agree with Professor Coates: “Whatever the right response, the issue is not likely to go away.” Id. John C. Bogle, Bogle Sounds a Warning on Index Funds, Wall St. J. (Nov. 29, 2018). In finance, most things that are now true seem obvious in hindsight. That is certainly the case for the success of index funds—even though, when the idea was first proposed, “strategy of simply tracking a broad market index was [at first] almost totally rejected by Wall Street.” Id. ; see also Baruch Fischhoff & Ruth Beyth, “I Knew It Would Happen: Remembered Probabilities of Once-Future Things, 13 Org. Behavior & Human Perf. 1 (1975) (providing early experimental evidence of the hindsight-bias phenomenon using President Nixon’s famous visit to China); Amos Tversky & Daniel Kahneman, Availability: A Heuristic for Judging Frequency and Probability, 5 Cognitive Psych. 207 (1973). See, e.g., Coates, supra note 19, at 20 (“[I]ndexation has generated real and large social benefits in the form of lower expenses and greater long-term returns for millions of individuals investing directly or indirectly for retirement.”). Id. at 10 & tbl.1; Lucian Bebchuk, Alma Cohen & Scott Hirst, The Agency Problems of Institutional Investors, 31 J. Econ. Persp. 89, 92 tbl. 1 (2017) (providing evidence that, on average, the largest five holders of the largest 20 U.S. public companies own more than 20% of the company’s shares). Id. at 13 & n.28 (“The bottom line is that indexed funds now own more than 20% and perhaps 30% or more of nearly all U.S. public companies.”). One reason that other analyses may understate the degree of passive ownership is that those figures frequently exclude pension-fund and foreign-investor ownership. Id. at 11-13. Adolf Berle & Gardiner Means, The Modern Corporation and Private Property (1932) (describing the classical concern that public-company investors “have surrendered the right that the corporation should be operated in their sole interest”). See, e.g., Blasius Industries, Inc. v. Atlas Corp., 564 A.2d 651 (1988) (Allen, Ch.) (providing the seminal statement of the Delaware principle that the “shareholder franchise is the ideological underpinning upon which the legitimacy of directorial power rests,” and observing in 1988, with the Chancellor’s typical prescience, that, after a period in which it was “conventional to dismiss the stockholder vote as a vestige or ritual of little practical importance,” “[i]t may be that we are now witnessing the emergence of new institutional voices and arrangements that will make the stockholder vote a less predictable affair than it has been”). For the seminal debate as to whether large institutional investors can be expected to play this role, compare Bernard Black, Agents Watching Agents: The Promise of Institutional Investor Voice, 39 U.C.L.A. L. Rev. 811 (1992) (providing arguments for why institutional investors may be an efficient provider of corporate oversight) with John C. Coffee, Jr., Liquidity Versus Control: The Institutional Investor as Corporate Monitor, 91 Colum. L. Rev. 1277 (1991) (describing potential limits of institutional-investor capacity to provide such oversight). Leo E. Strine, Jr., Can Corporations Be Managed for the Long Term Unless Their Powerful Electorates Also Act and Think Long Term?, 66 Bus. Law. 1, 4 (2010). Anyone serious about accountability should be equally concerned about the dissonance between large institutions and the investors they represent as they are about the faithfulness of corporate insiders to the interests of shareholders. That is why Delaware’s Chief Justice has been right to identify the role of institutional investors in failing to check corporate practices that so frequently raise objections from ordinary American shareholders. See Leo E. Strine, Jr., New York University School of Law Distinguished Jurist Lecture, Fiduciary Blind Spot: The Failure of Institutional Investors to Prevent the Illegitimate Use of Working Americans’ Savings for Corporate Political Spending (November 29, 2018). Lucian Bebchuk & Scott Hirst, Index Funds and the Future of Corporate Governance: Theory, Evidence, and Policy (working draft) (November 2018); see also Bebchuk, Cohen & Hirst, supra note 23, at 94. See Zohar Goshen and Richard Squire, Principal Costs: A New Theory for Corporate Law and Governance, 117 Colum. L. Rev. 767 (2017) (“When investors exercise control, they make mistakes due to a lack of expertise, information, or talent, thereby generating [what those scholars call] principal competence costs.”). Relatedly, increasing concern about the role of proxy-advisory firms is based, in part, on corporate insiders’ conviction that those firms wield too much power—influence drawn in part from the size of institutional investors who follow advisor recommendations. See Ronald J. Gilson & Jeffrey N. Gordon, The Agency Costs of Agency Capitalism: Activist Investors and the Revaluation of Governance Rights, 113 Colum. L. Rev. 44 (2011) (presciently observing, some seven years ago, the increasing importance of “divergence between the interests of record owners—the institutional investors—and the beneficial owners of those institutional stakes,” and noting that activist investors “play a specialized capital market role of setting up intervention proposals for resolution by institutional investors”). See Securities and Exchange Commission, Final Rule: Disclosure of Voting Policies and Proxy Voting Records by Registered Management Investment Companies, File No. S7-36-02 (April 14, 2003) (requiring a “fund to file with the Commission and to make available to its shareholders, either on its website or upon request, its record of how it voted proxies relating to portfolio securities” on Form N-PX). In particular, the annual letter of Larry Fink, the Chief Executive Officer of BlackRock, has become essential reading for those interested in how that firm will approach voting during each proxy season. See, e.g., Alicia McElhaney, Larry Fink to CEOs: Contribute to Society or Lose BlackRock’s Investment, Institutional Investor (Jan. 16, 2018); see also Coates, supra note 19, at 20 (describing the publication of institutional investors’ “stewardship codes” as a potential policy prescription). See id. at 20 (noting that, although such codes are prominent in the United Kingdom, they “suffer from the usual problems of self-governance, including weak enforcement,” and are “modest in their effects”). See Ryan Bubb & Emiliano Catan, The Party Structure of Mutual Funds (working paper) (June 22, 2018) (“apply[ing] standard unsupervised learning tools from the machine learning literature to analyze a comprehensive dataset of mutual funds’ votes”). In separate work, a different group of authors contends that a two-party model more neatly fits the voting data, and makes an importantly distinct methodological choice: grouping fund voting behavior at the mutual-fund, rather than the fund-family, level. Compare Bubb & Catan, supra note 36, with Patrick Bolton, Tao Li, Enrichetta Ravina & Howard Rosenthal, Investor Ideology (working paper) (July 2, 2018). See Bubb & Catan, supra note 36, at 43 & fig. 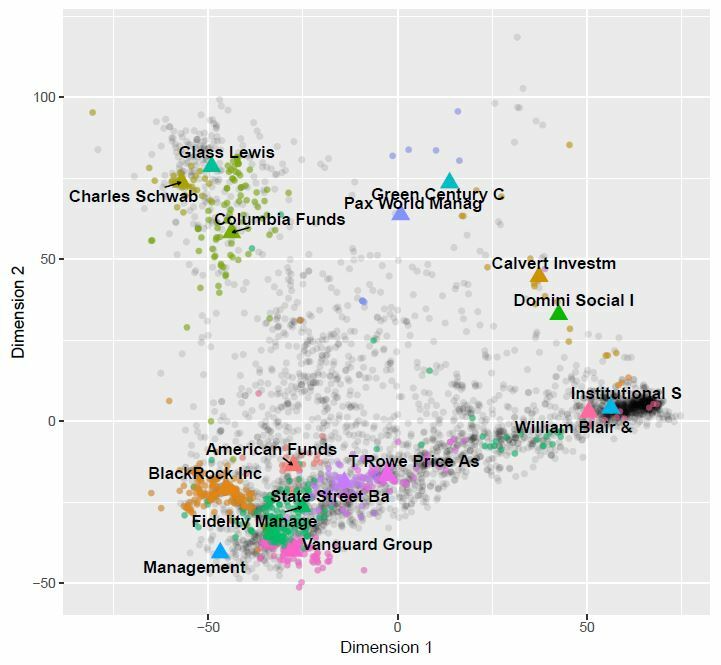 3 (providing the relative positioning of major institutional investors’ vote preferences in a spatial model in comparison to the positions of management and ISS). Importantly, as pointed out by Bolton, Li, Ravina & Rosenthal, supra note 37, at 7, obtaining such information for other types of investors can be difficult, and may reach beyond the scope of the SEC’s jurisdiction. For now, our focus should be on making better use of the information that mutual funds already provide to the SEC to help investors understand how their mutual-fund choices can influence corporate elections. As illustrated by both Bubb & Catan, supra note 36, and Bolton, Li, Ravina & Rosenthal, supra note 37, investors will need to know the relative voting behavior of the funds they are considering—in comparison, perhaps, to the voting recommendations of management and ISS. This may aid investors’ understanding of whether the institution they are choosing to invest with reflects their own preferences regarding corporate elections.